Ukraine In Turmoil - A Somalia scenario? DNIPROPETROVSK, Ukraine -- With violence in eastern Ukraine waning (for the moment), attention has tentatively turned to the country’s post-war contours. Both the government in Kiev and the separatists claim to be withdrawing heavy weaponry, following an agreement on September 20th to create a 30km (19 miles) buffer-zone, though clashes have continued in some places. Ukraine’s president, Petro Poroshenko, claims that “serious work” is under way to build a defensive line around rebel-controlled territory. No matter its final shape, Ukraine will be left with boorish new neighbours on its eastern flank. Directly west of Donetsk, the Dnipropetrovsk region is preparing for more trouble, including banditry, kidnapping and terror. Dnipropetrovsk officials have faced assassination attempts by “liquidation groups” from the Donbas in recent months, and criminals have begun arriving under the guise of refugees. 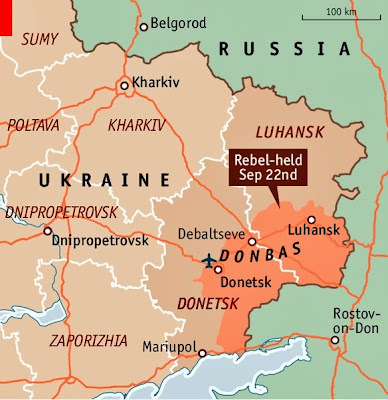 Borys Filatov, a deputy governor of Dnipropetrovsk, speaks worryingly of a “Somalia scenario”, under which the Donbas becomes a swathe of ungoverned territory harbouring bandits who cross into the rest of Ukraine to raid, kidnap and steal. Another troubling precedent lies in Moldova’s breakaway Transdniestria region, where organised crime and corruption have flourished under a Russian-backed regime. Throughout Dnipropetrovsk, fortifications are cropping up along the main roadways. The most robust checkpoints feature crews of roughly 20 men, networks of trenches, bunkers and anti-tank barriers. Any cars with Donetsk or Luhansk licence plates face searches from armed soldiers. While officials downplay these measures as a means of “control”, construction of a new internal border has in effect begun. Reflecting the sorry condition of the Ukrainian state, Dnipropetrovsk’s security has been left to the private sector. Local business, private donors and concerned citizens fill the coffers of two non-state charitable funds, one for defence and the other for humanitarian causes. While the regional administration oversees the projects, the money remains outside state structures in order to bypass a centralised, “unjust and ineffective” system, says another deputy governor, Svyatoslav Oliynyk. Such a strategy, however, begets concerns over corruption and command structures at the checkpoints, where a poorly co-ordinated mix of volunteer battalions, police and security-service officers stand guard. Over one newly constructed bunker on the border with the Donetsk region fly two flags: Ukraine’s blue and yellow, and the red-and-black nationalist flag of the local Sicheslav battalion. The motley crew on duty answer to different commanders, and at times receive conflicting orders. When asked about Mr Poroshenko’s “special status” law for the Donbas, a group of soldiers at the checkpoint scoff, calling it “traitorous”. The regional elite accepts the law with gritted teeth—they know from bitter experience about the futility of fighting the Russian army. Two lists taped to the front windows of the administration building in Dnipropetrovsk enumerate 400 names of those missing and 800 prisoners. Throughout the conflict, Dnipropetrovsk has borne a disproportionate share of the burden. “Every day we deal with battalions, security, the wounded, the killed, the ill, prisoners, funerals, and so on, while in Kiev they just work on elections,” says Mr Filatov, who recently announced plans to run for the national parliament, as did Mr Oliynyk. Their boss, the governor of Dnipropetrovsk, Ihor Kolomoisky, began supporting the country’s military preparations early on, building up volunteer battalions long before the Ukrainian government threw its full weight into the war. The region has suffered more than most in terms of wounded soldiers and soldiers killed in action. Although the death toll has slowed since the ceasefire on September 5th, it has yet to stop entirely. Dnipropetrovsk’s 25th airborne brigade remains stationed around Debaltseve, a city between Donetsk and Luhansk, where the troops take and return heavy artillery fire daily. Residents say that the ceasefire has not halted the fighting, nor has it restored running water, which was cut nearly a month ago. 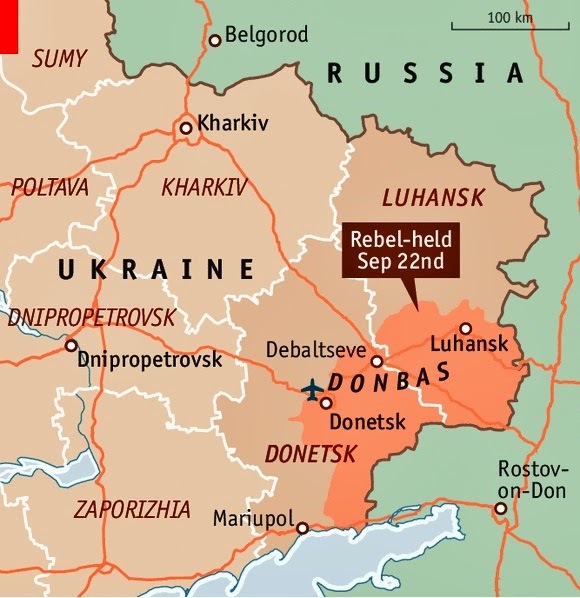 Clashes have also persisted near the port of Mariupol and Donetsk airport, which Ukrainian forces still control. It is “a ceasefire in name only”, declares Philip Breedlove, NATO’s supreme allied commander in Europe. With the risk of renewed war still looming, training and recruitment for volunteer battalions continues in Dnipropetrovsk.